With summer coming quickly and the return of major league baseball, we are excited to spend the summer months watching some baseball, drinking some beer and eating some amazing baseball stadium food. While most of us think of peanuts and hot dogs when they think of stadium food, these major league teams aren’t messing around and have come up with some crazy snacks for you to choose from while watching the big game. 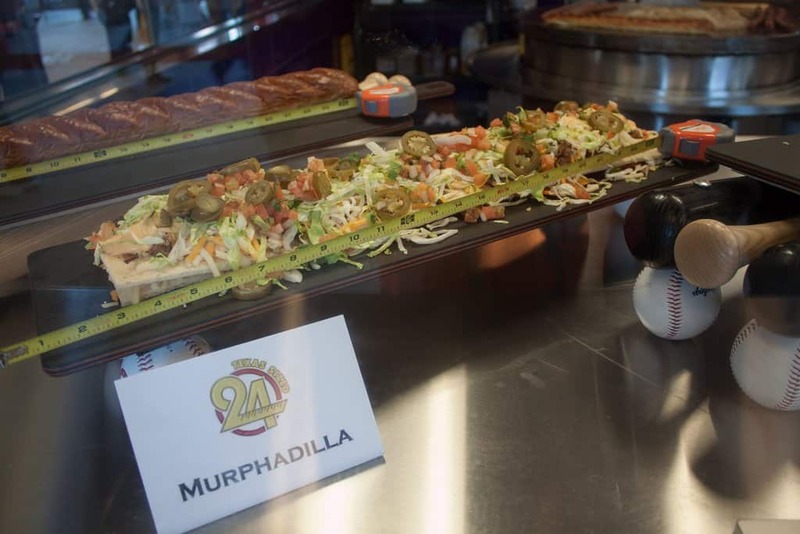 Check out 20 of the wildest baseball stadium snacks here! Instead of making this into a burrito, the Arizona Diamondbacks have decided to make it into a hot dog. 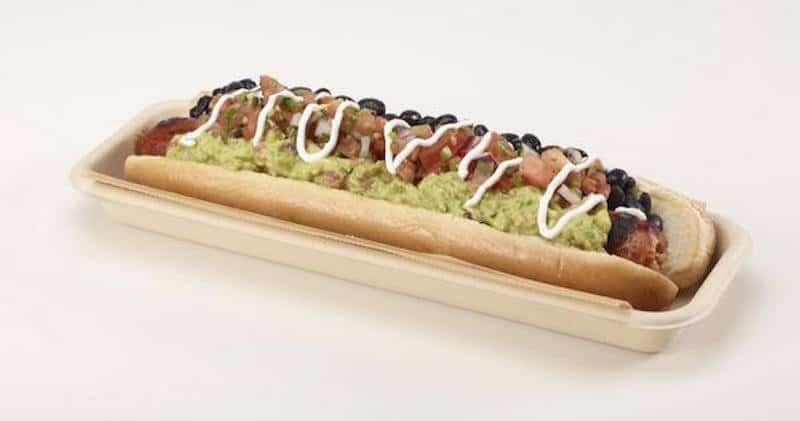 It is a footlong habanero sausage topped with black beans, sour cream, guacamole and pico de gallo. We might prefer this version over a normal burrito! The people sitting next to you might not like you eating these, but they look amazing. 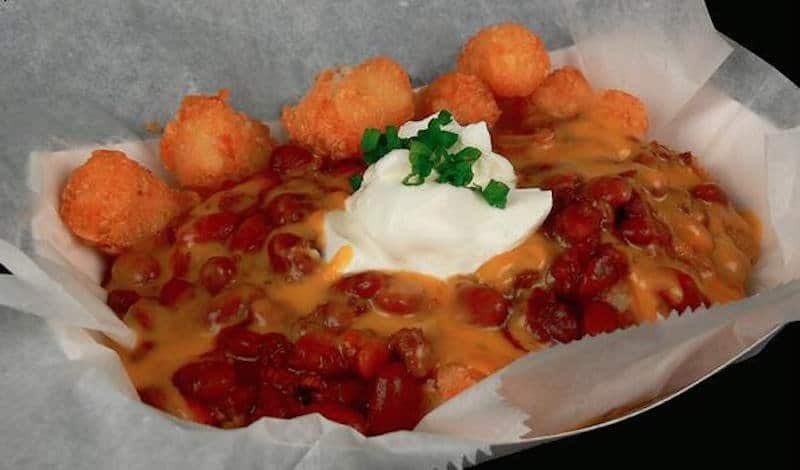 The Pittsburgh Pirates have replaced the tortilla chips with tater tots for this snack, which is topped with chili, cheese, sour cream and chives. 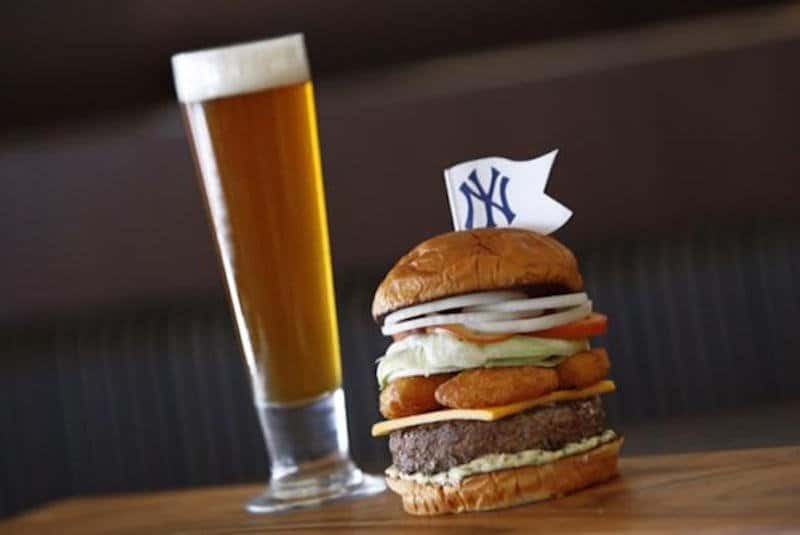 The New York Yankees didn’t know when to stop adding things to this burger, as it contains cilantro dressing, cheese, garnish, and fried mac and cheese layered between a King’s Hawaiian bun. We are not sure how anyone can even bite into it, but we’d definitely try! The Toronto Blue Jays are getting all fancy with this sandwich! 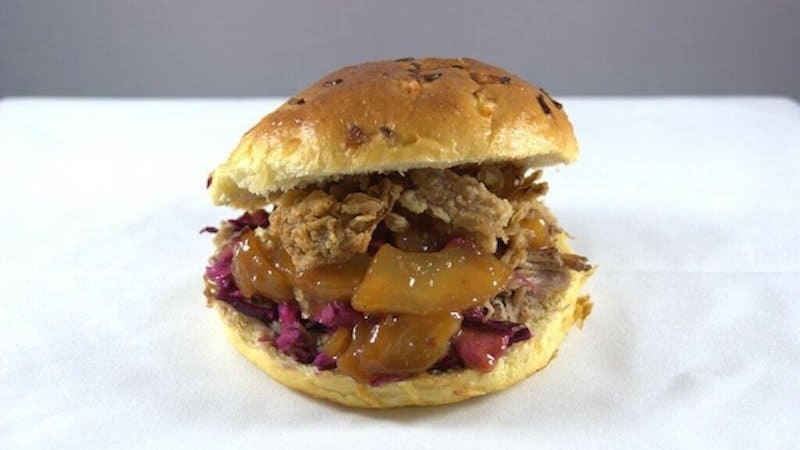 This is apple chutney, dijon and slaw mixed with smoked pork on an onion bun. Fancy or not, we want one! 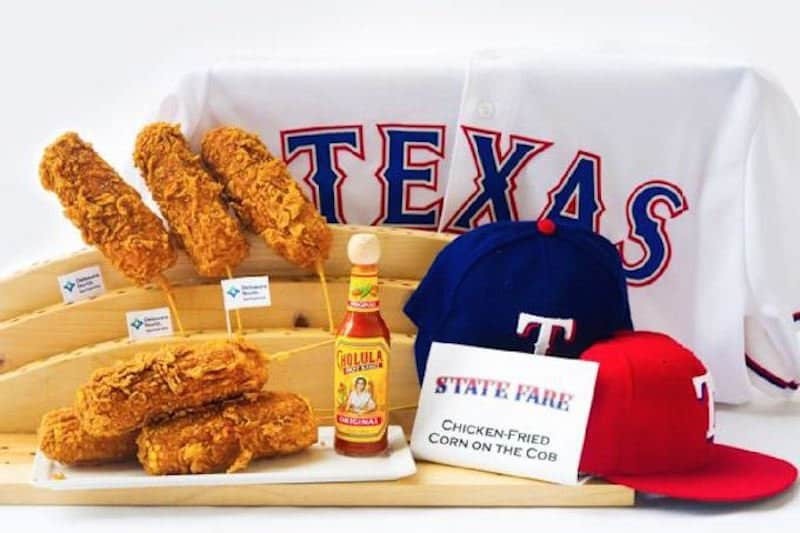 Corn on the cob might be a healthy option for a ballgame, but not in Texas! The Rangers are battering it up and frying it for their fans, which makes it look absolutely amazing. 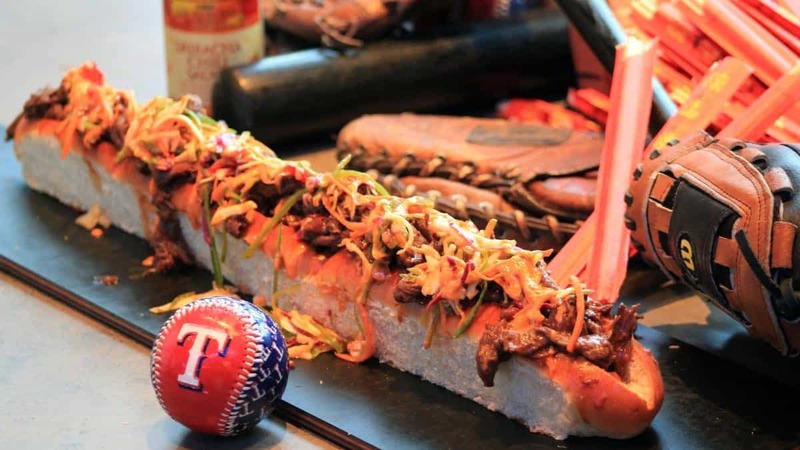 The Texas Rangers love their outfielder Shin-Soo Choo, so they made this sandwich for him. It is a 24-inch sandwich and contains Asian beef topped with spicy slaw and Sriracha. Want to try it? Well, get ready to pay $26! 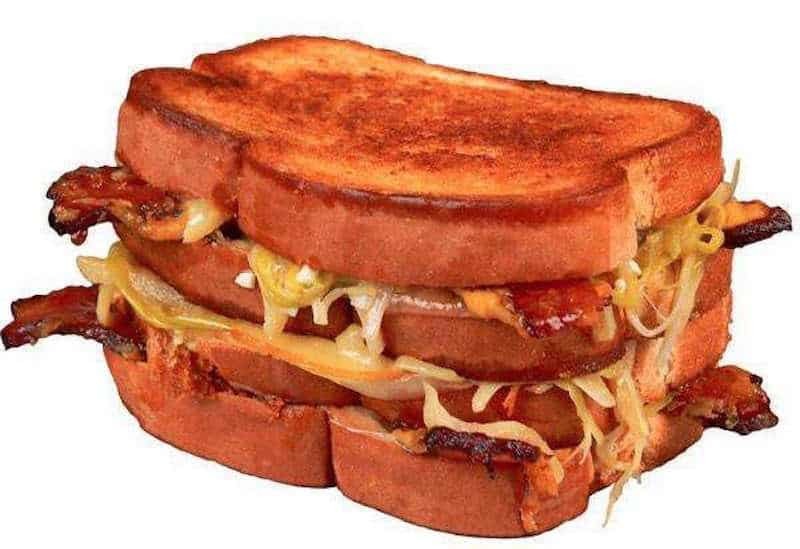 While cheering on the Pittsburgh Pirates you can also enjoy The Closer, which is two grilled cheese sandwiches made with nine different cheeses smushed together. Add in some candied bacon and sounds like a winner to us! How do they deep fry oysters in Colorado? Well, they don’t! 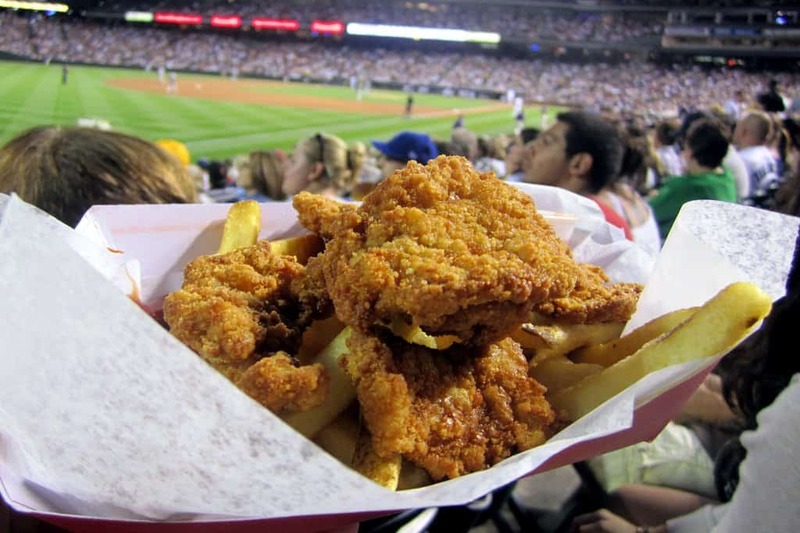 The Colorado Rockies serve Rocky Mountain Oysters at their home games, but they happen to be deep-fried bull testicles! However, people still keep eating them. 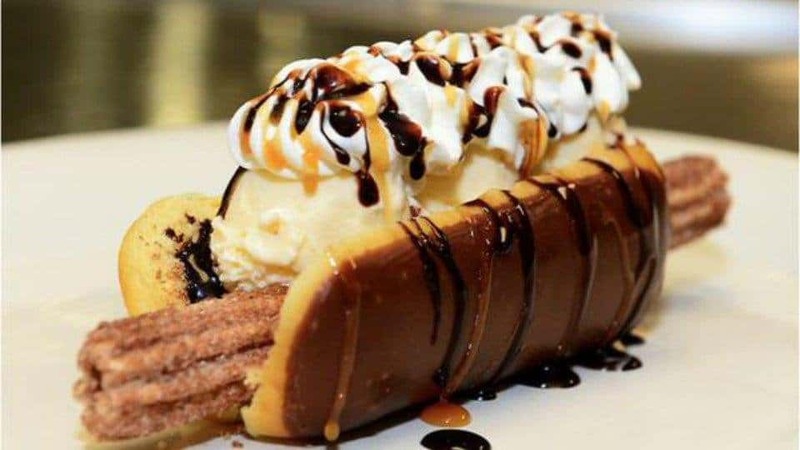 The Arizona Diamondbacks have introduced a Churro Dog this season, which is a cinnamon churro on a Long John chocolate-glazed donut. This is topped by frozen yogurt, caramel and chocolate sauces and some whipped cream. This will help cool you down in Arizona while watching the game! This is a favorite of Texas Rangers’ outfielder David Murphy, hence the name. It is 24 inches of shredded cheese, pico de gallo, beef brisket and more in a quesadilla; all on a bed of Doritos. They had us at 24 inches! 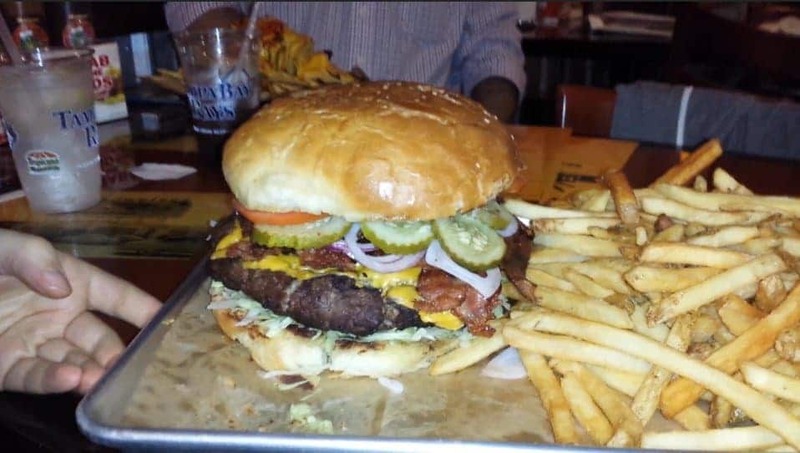 The Tampa Bay Rays offer this four-pound burger, but with a twist! If you can finish the burger and a pound of fries that come with it, then you win two season tickets and a t-shirt. Sounds fun, but not many have been able to complete the task. 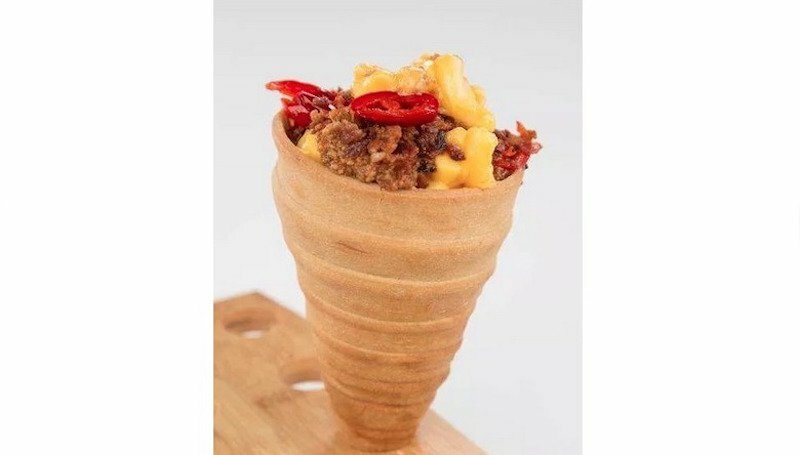 You can also grab this Mac Bat at a Tampa Bay Rays game, which is a cone filled with mac and cheese! Top it off with bacon, chili or tomatoes and you’ll be a hit among the crowd. This may look like a typical hot dog, but the home of the Pittsburgh Pirates mixes it up a little bit. It is a hot dog on a potato roll with fried onions on top, but they add in mini pierogies and we want one right now! 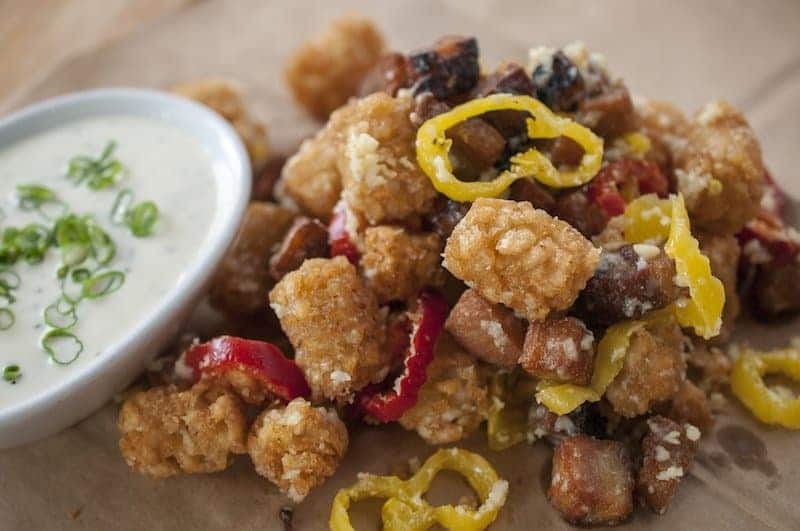 They look like tater tots, but those are little chunks of heaven! They are fried pieces of cheese topped with some banana peppers and can be enjoyed at Safeco Field. We never thought we would want anything but ice cream in a waffle cone, but this totally changes our mind! 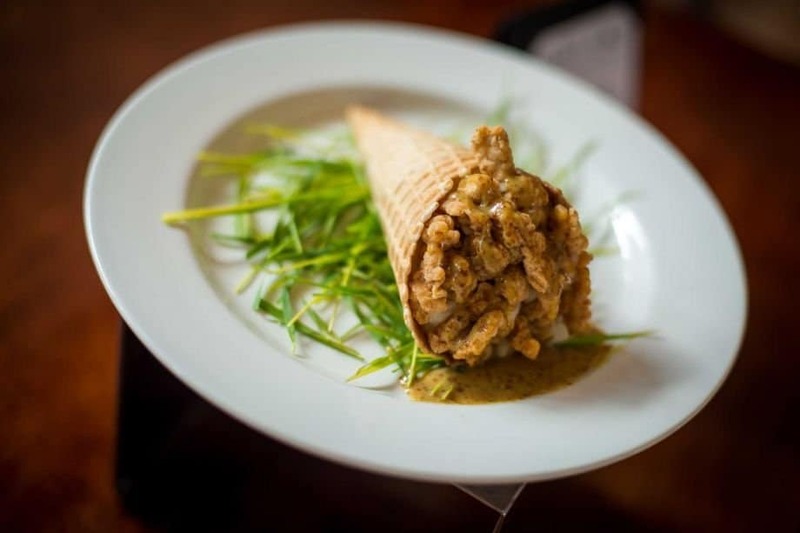 The Houston Astros give us a waffle cone stuffed with mashed potatoes and topped with fried chicken nuggets and honey mustard. 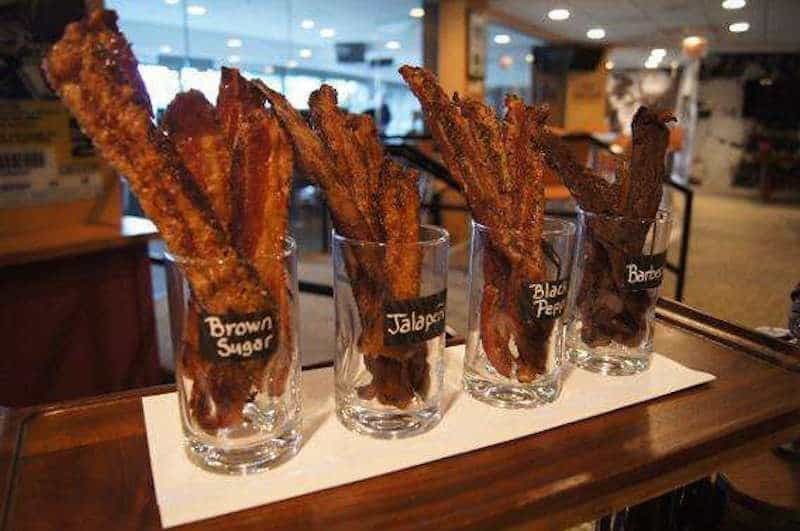 While flights of beer might be popular at breweries, the Chicago White Sox are offering flights of bacon instead! The bacon comes in many different flavors and we just drooled a little while typing this. They aren’t messing around in Chicago, as you can get this huge treat at a White Sox game. 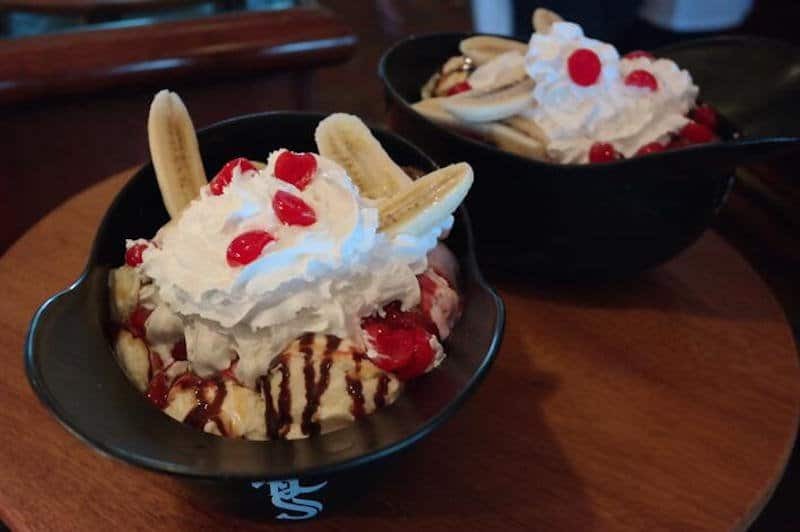 It is a full-size helmet and contains 12 scoops of ice cream, a few bananas, whipped cream, chocolate and strawberry sauce and, of course, a spoon. 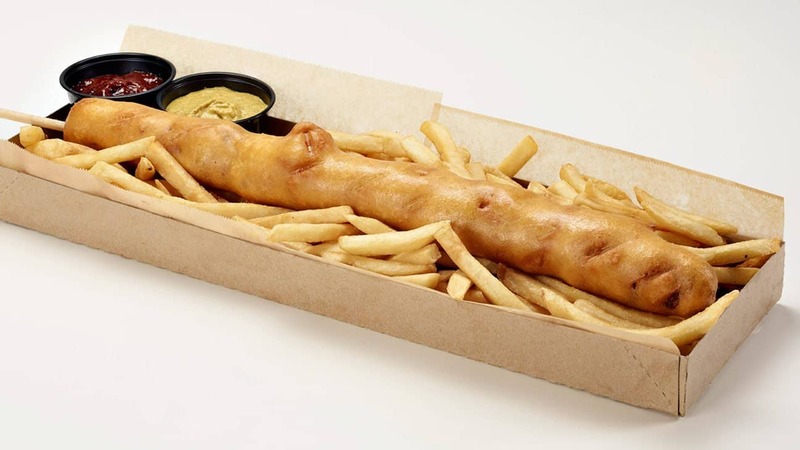 The Arizona Diamondbacks also offer this 18-inch corn dog, which happens to be stuffed with jalapenos, cheddar, and bacon. It sells for $25, but is often sold out because of high demand! 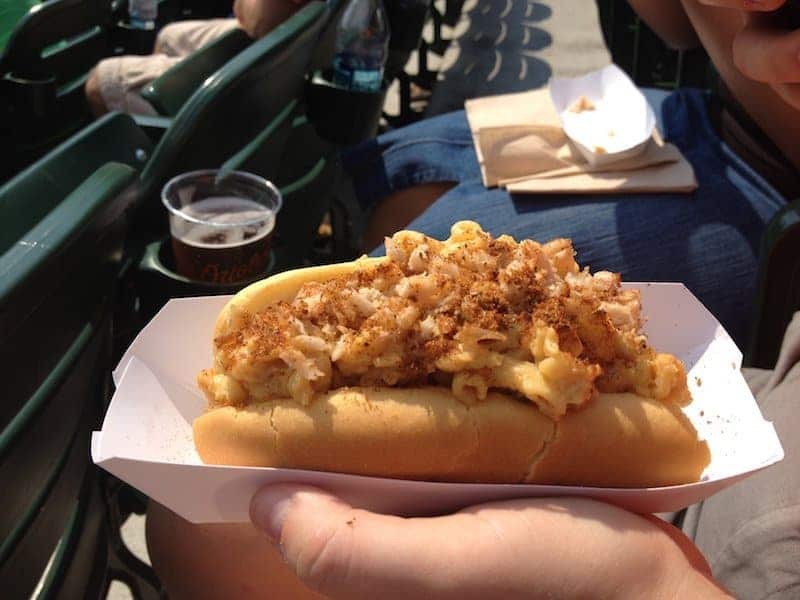 You can get a fancy hot dog while watching a game at Camden Yards. This is a hot dog split down the middle and then stuffed with mac and cheese and topped with crab meat and some Old Bay Seasoning to finish it off. You have to get french fries when you’re at a baseball game, right? Well, the Los Angeles Dodgers’ most famous alumni has added some meatballs to these fries and we’re dying to give them a try!